2012-13 Panini NBA Hoops Taco Bell Basketball cards signal the return of the hobby to fast food promotions. Over the years, many sets have been distributed alongside burgers and fries. This time it might be tacos and burritos, but the idea is the same. 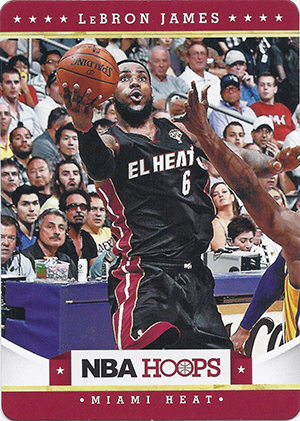 Shop for 2012-13 NBA Hoops Taco Bell cards on eBay. Distributed with kid's meals, 2012-13 Panini NBA Hoops Taco Bell Basketball has a 150-card checklist. Each of the league's 30 teams has five cards. An updated version of the main 2012-13 NBA Hoops set, these new cards feature updated photography for several veterans on new teams. This means Steve Nash and Dwight Howard in their Lakers uniforms and Ray Allen as a member of the Heat. Fourteen rookies also have new photos and have the Rated Rookie logo added to them. Taco Bell cards are easily discernible from regular Hoops cards by their rounded corners. Every kid's meal sold during the promotion comes with a five-card 2012-13 Panini NBA Hoops Taco Bell Basketball pack.